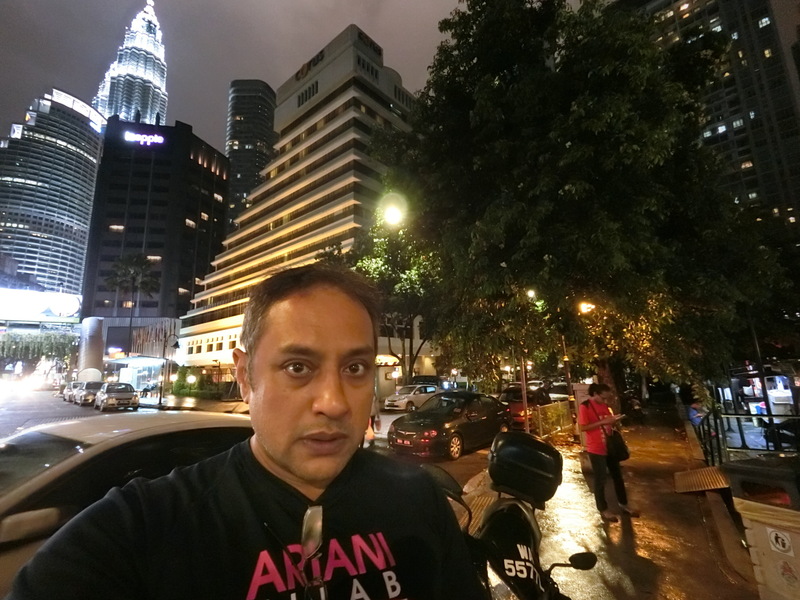 In search of supper, Maryati and I wandered to Kuala Lumpur where we opted for some Street Dining experience à la Food Truck Park. 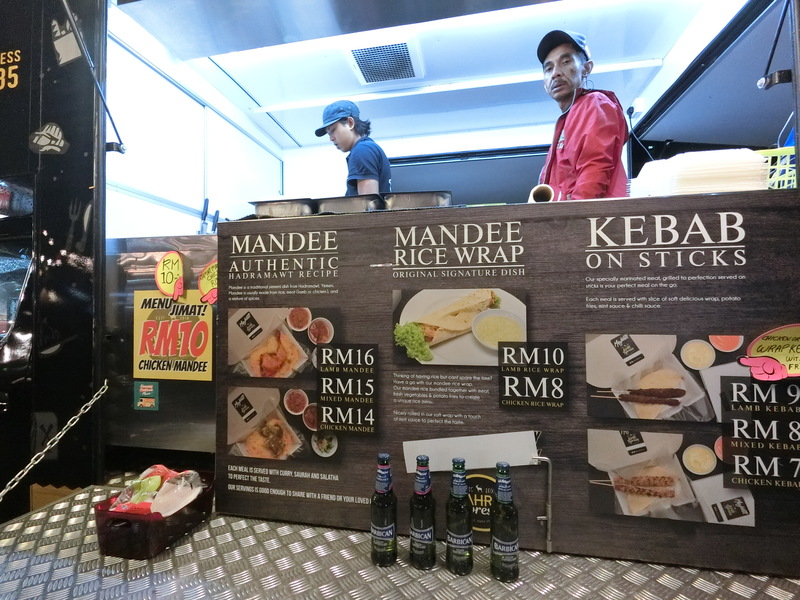 Despite the drizzle, there were punters queuing for freshly hot meals at the many food trucks available. It took us a while to decide what to order because there were so many variety of cooking styles and eye-catching menus on display. Finally, we opted for some Vietnamese Spring Rolls and the Mandi Lamb Rice Wrap. Check-out the culinary video clips below! Since the open air tables with umbrellas were fully occupied, we ate our food in our nearby parked car. 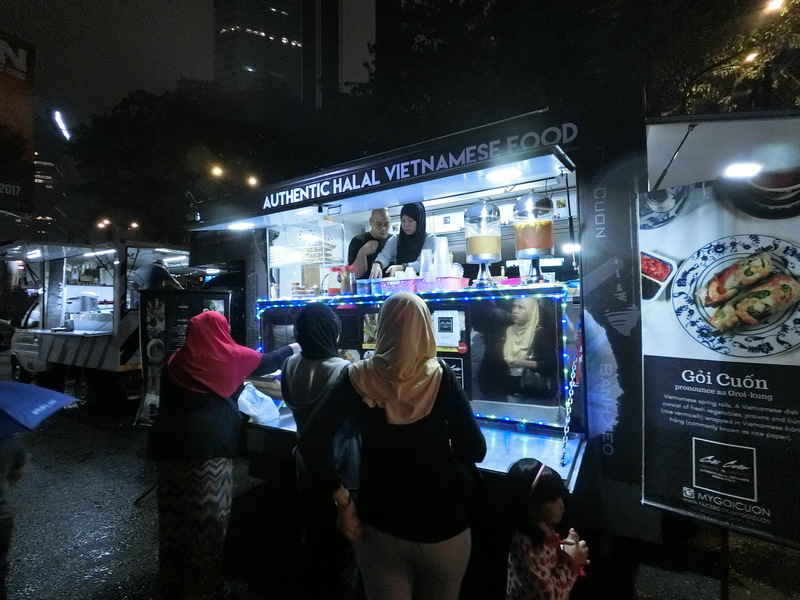 Our hot meals were PREPARED in Food Trucks & GOBBLED UP in a stationary car which gives new meaning to the phrase, ‘Meals On Wheels’! 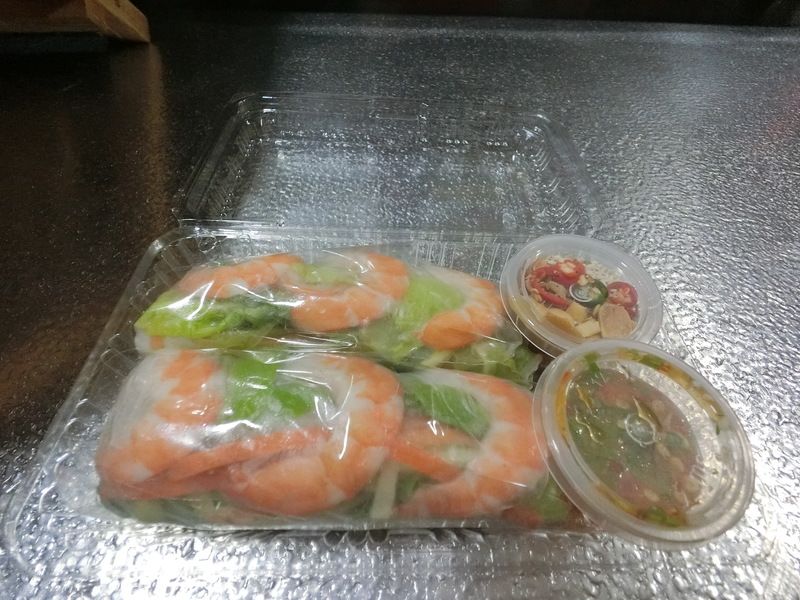 Vietnamese spring rolls of fresh vegetables, prawns and bún (rice vermicelli) wrapped in Vietnamese bành tráng (rice paper). 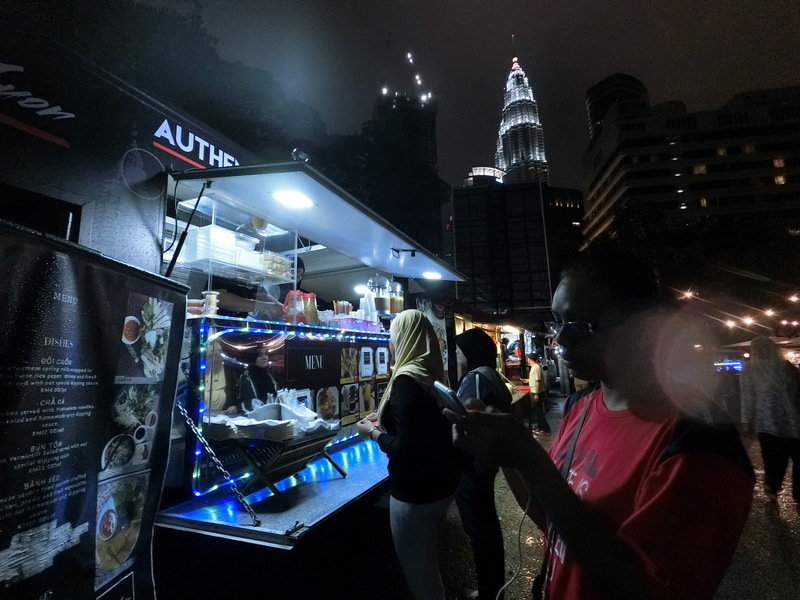 The menu prices are not as cheap as our regular roadside food stalls, but the food truck mobile kitchen were hygienic, plus you can sample many different specialty foods if you are tired of the usual local “goreng-goreng” variety. 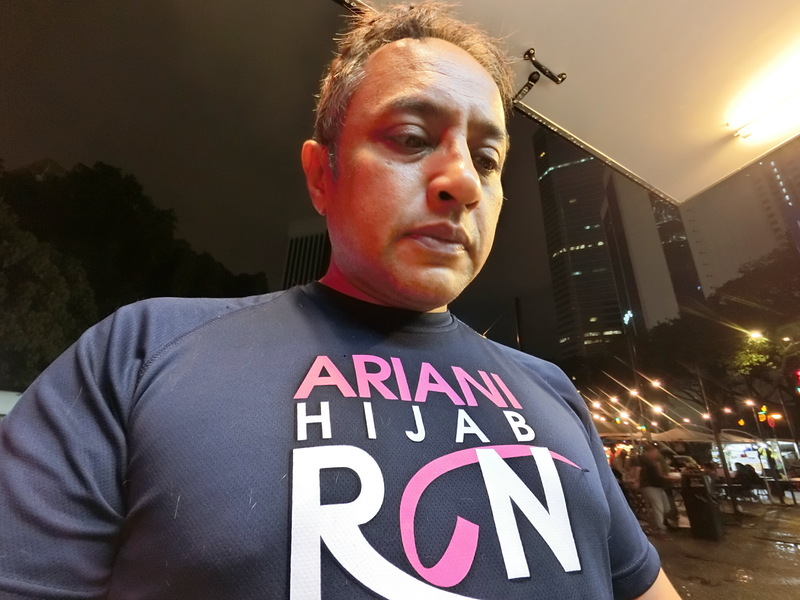 This entry was posted in 2017, Casio Exilim Malaysia, Eat, Food, Food Blog, January, Kuala Lumpur, Lifestyle, Review, Uncategorized, Video and tagged casioexilimmalaysia, Food, food truck, kualalumpur, lifestyle, mygoicuon, Review, Street Dining, urban. Bookmark the permalink.